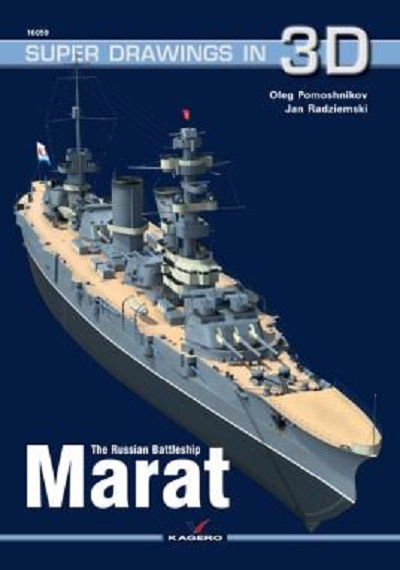 ​In the interwar period the battleship "Marat" was considered a symbol of the naval power of the Soviet Union. She was the most-described and filmed ship of the Land of the Soviets. ​In her 40-year service, rich in events, she survived four wars, but only in one of them - the Civil War - she used her main guns in and engagement with enemy ships. Only once in her career. In other conflicts, she served as a monitor rather than a battleship, shelling mainly land targets and carrying out counter-battery fire. At the end, she fell victim of the destructive power of German dive bombers. From that moment, she was a battleship only on paper. Mutilated and devoid of propulsion, she was still biting at the Germans from her remaining guns, and after the war, young pupils of the maritime craft appeared on board. ​Though it sounds absurd, ever her reconstruction as a battleship was considered. This misconceived idea was not fortunately realized and the wreck - because it became one in the final period of service - finally went for scrap. ​Kagero is a publisher based in Lublin, Poland. They publish books in both English and Polish. This book is all in English. It is soft-cover of 70 pages in 8 1/2" x 11" page format. The cover art shows the Marat from above the starboard side posed against an all-black background. The book contains 85 color 3D walk-around type illustrations of every inch of the ship's anatomy. Plus, 18 color 3D illustrations of weapons and turrets aboard her. Four 3D illustrations of the 40 foot steam boat aboard her and four 3D illustrations of the 42 foot one. The last page of the book has cover arts of 58 books about ships that Kagero publishes. The back cover has a color 3D illustration of the Marat from above the stern. A single large sheet in 24 1/2" x 18 3/4" format, folded 4 times is inserted into this book. One side has line drawings in 1/350th scale of the port and starboard sides of the Marat, a top view and front and rear views of the tower. The reverse side has line drawings of the weapons and turrets in 1/50th scale and the steam boats in 1/100th scale. A pair of cardboard goggles with one red lens and one blue lens is included to view the 3D illustrations. This is a neat book about this ship. It will be of great interest to naval historians and modelers alike. ​I want to thank the folks at Casemate Publishing who sent me this sample and also Kagero.